I realized it's been quite a while since I've featured a fungus or fungus-like organism on my blog, and what better day to feature one than on Fungus Friday?! The harefoot mushroom (the common name apparently comes from the appearance of the young mushrooms growing up from the ground; sure doesn't look like a rabbit foot to me) used to be considered a species of Coprinus, back when everything that produced black spores and digested itself when fully mature was a Coprinus. Now we know that this trait is actually shared between a few genera of fungi, and not all of them are related to each other. 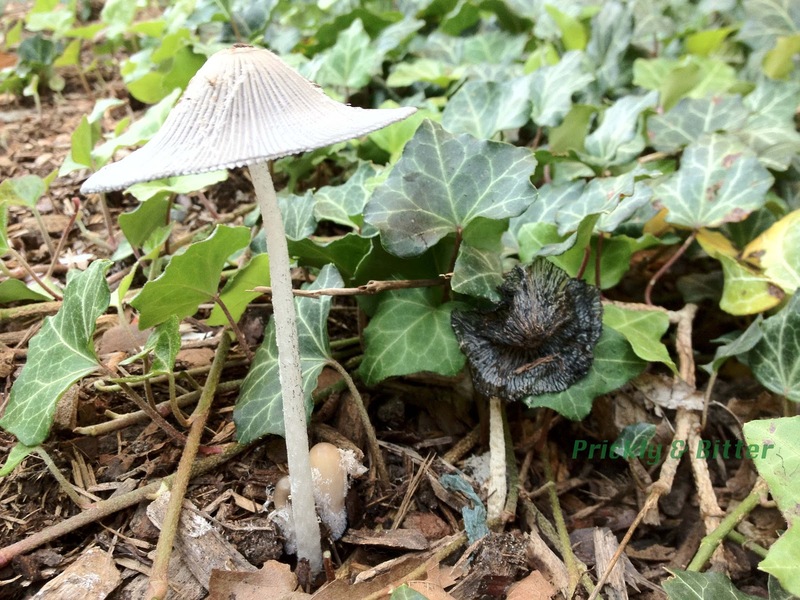 One way that seems to be effective to tell Coprinopsis from Coprinus is whether the fruiting body is edible. If edible (but with dangers; I will discuss it below), it is much more likely it belongs in Coprinus, where species of Coprinopsis are considered inedible; they won't kill you or make you sick if you eat them, but they certainly aren't tasty. Many "inedible" fungi also contain gastrointestinal irritants that will make your digestive system revolt against you for a few hours but with no real danger of severe dehydration (this is not true for other species of fungi labelled "poisonous"!). Deliquescent fungi are often accused of distributing their spores through their auto-digest slime, since there seems to be quite a population of flies that swarm around them if left alone. This statement is most often associated with the shaggy mane, Coprinus comatus, which gives a spectacular auto-digest show on lawns across North America and Europe in the late summer and early fall. If you sample that black, blobby mess and look at it under the microscope, it shouldn't be surprising to note that there are very few, if any spores, present in the mess. Why shouldn't this be surprising? Well, two reasons. The whole point of a fungus producing spores is to disperse its future offspring to more suitable habitat (in fact, some fungi don't even produce mushrooms until they have completely depleted the resources in a given area). Depositing your spores directly beneath you in hopes they'll have a better life than you are currently having is a pretty silly idea! You would be giving your offspring a disadvantage before they even got off the ground (literally). The other clue this shouldn't be surprising is on the stem, if you look closely. 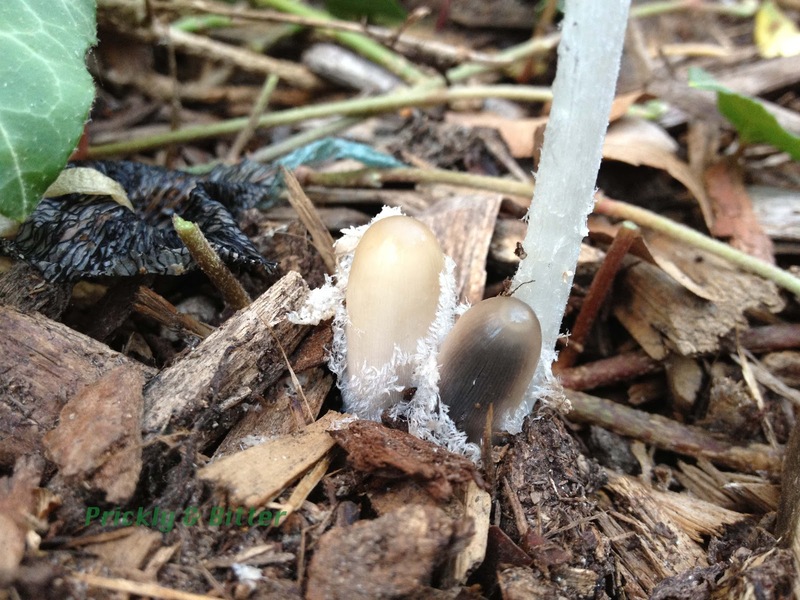 Normally, the stem of both Coprinus and Coprinopsis is pure white (some are yellow or orange, but never with black spots). If you look carefully about 2/3 of the way down the stem of the second image, you can see a black fluff on the stem. If you were to take a tiny sample of that with tweezers and look at it under the microscope, you would see that those are the surface hairs of the stem absolutely covered in the black spores of the mushroom. 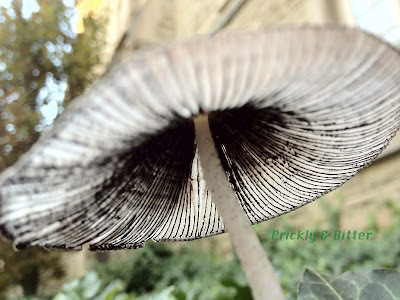 The spores, produced on the gills, are blown away in the wind as soon as they are mature. If there are no air currents at the time that a spore detaches, it follows the rules of gravity and falls straight downwards, sometimes getting caught on surface hairs on its way to the ground. By the time the cap of the mushroom starts to be digested by the fungus' own enzymes, almost all the spores have already dispersed. 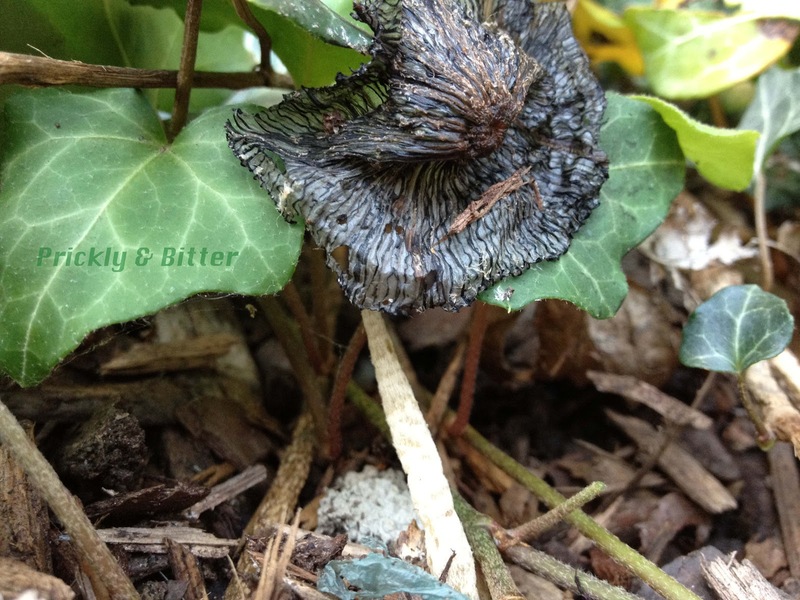 Amazing how some fungi can trick us! The third picture, one of my favourite pictures I've ever taken (as proof, it's the lock-screen image on my iPhone), shows how the mushroom's gills are the first thing to turn black, and that's likely just the colour of the spores being displayed as a change in colour of the gills. Species of Coprinus are eaten by people in North America and Europe, and will likely remain that way for quite a long time. Should you choose to eat a shaggy mane or a close relative, some words of caution. All of these species, whether Coprinus or Coprinopsis, deliquesce very quickly after being picked. Unless you want to eat a black soupy mess (I've heard it tastes the same, but looks more like black vomit than a mushroom), you must eat them very soon after picking. Any wild mushroom, no matter the species, MUST be cooked before consumption. Many species of fungi (including the common button mushroom available in grocery stores) contain compounds that have been shown to be carcinogenic. These compounds are very unstable when heated, so cooking will break them into harmless chemical pieces. The shaggy mane is famous for containing the chemical coprine, which mimics the alcoholic drug antabuse. 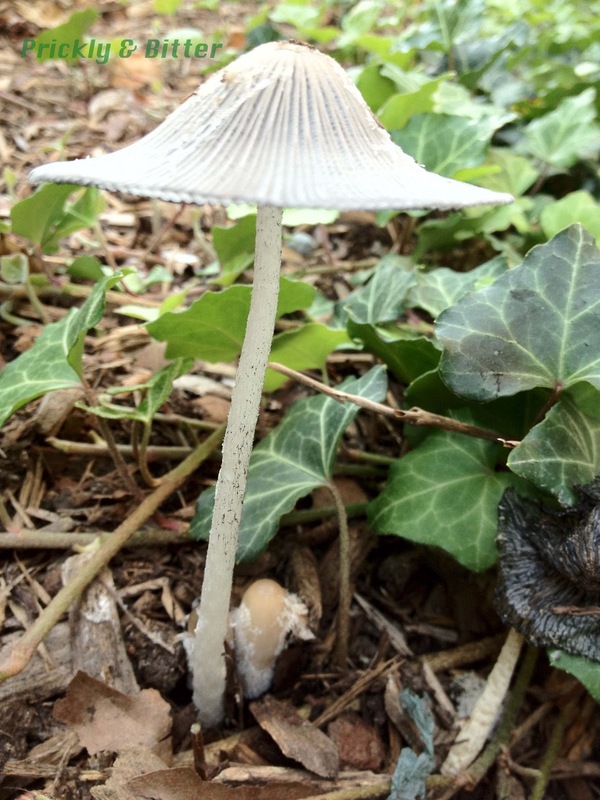 When mixed with alcohol, species of Coprinus will cause spectacular projectile vomiting that makes the victim feel like they would rather die than vomit any more (the whole point of antabuse; it certainly is not potent enough to kill anyone, but will make you rethink mixing it with alcohol!). If you're going to consume any kind of wild mushroom, it's always best to make sure the meal is alcohol-free. It's also probably best to avoid alcohol for the next few meals; some other species that also have antabuse-like properties take days for their toxins to clear from the digestive tract and can induce vomiting 48-72 hours after consumption! Excellent observations mushrooms. Very good observations and comments. I read some of your blogs, all praise for your work. It's nice to know that you are very dedicated to nature and mushrooms. Thanks for the kind words, Dejan! 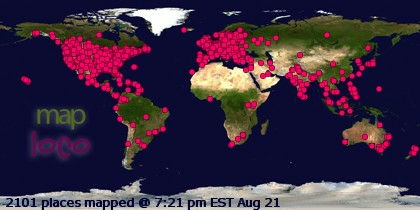 I'm glad you have enjoyed reading my blog. I've been following your mushroom pictures on Google+ for quite a while; you take some beautiful photographs!